Freckled and sandy-haired, rather tall and awkward, Jefferson was eloquent as a correspondent, but he was no public speaker. In the Virginia House of Burgesses and the Continental Congress, he contributed his pen rather than his voice to the patriot cause. 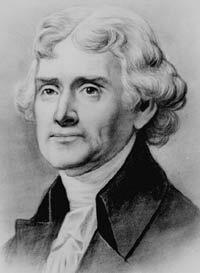 As the “silent member” of the Congress, Jefferson, at 33, drafted the Declaration of Independence. In years following he labored to make its words a reality in Virginia. Most notably, he wrote a bill establishing religious freedom, enacted in 1786. Jefferson succeeded Benjamin Franklin as minister to France in 1785. His sympathy for the French Revolution led him into conflict with Alexander Hamilton when Jefferson was Secretary of State in President Washington’s Cabinet. He resigned in 1793. As a reluctant candidate for President in 1796, Jefferson came within three votes of election. Through a flaw in the Constitution, he became Vice President, although an opponent of President Adams. In 1800 the defect caused a more serious problem. Republican electors, attempting to name both a President and a Vice President from their own party, cast a tie vote between Jefferson and Aaron Burr. The House of Representatives settled the tie. Hamilton, disliking both Jefferson and Burr, nevertheless urged Jefferson’s election. During Jefferson’s second term, he was increasingly preoccupied with keeping the Nation from involvement in the Napoleonic wars, though both England and France interfered with the neutral rights of American merchantmen. Jefferson’s attempted solution, an embargo upon American shipping, worked badly and was unpopular. Jefferson wished to be remembered for 2 things, the Declaration of Independence and the foundation of Virginia University.